This decorated early Bronze Age axehead was ploughed up from a field on high ground at Culbin near Evanton and Dingwall in 1986. 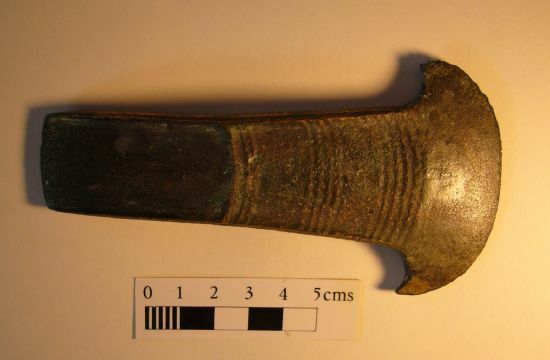 It is a decorated flat axe, dating to between c. 1900-1700 BC, and is currently on display at Dingwall Museum. It appears to have been a single find, since detailed examination of the field after the find revealed no other objects. The axehead has decoration on both sides and the hammered flanged edge with herring bone patterns and parallel lines. The closest comparable find is from Rosskeen, near Alness (now in the Ashmolean Museum, Oxford). Flat bronze axeheads in general date to the early Bronze Age, and are found throughout Scotland and the rest of Britain and Ireland. Some were made locally, as shown by a mould from Strathconon and Culbin Sands near Nairn, although these would not have produced the distinctive crescentic-shaped blade of the Culbin axe. Other flat axes may well have been imports, many from Ireland, traded as complete objects or blanks. This decorated bronze axehead would have been an object of great wealth and a symbol of power to its owner. If made from raw materials – copper and tin – the tin would have had to be imported, probably from Cornwall. Or perhaps other bronze objects were melted down. Only the very wealthy in society would have access to such materials. The use of axes as symbols of power has a long history, with polished stone axes from the Neolithic found throughout Britain, including the Highlands, giving way to metal axeheads of various forms in the Bronze Age. The Culbin find provides evidence of the wealth and connections of early Bronze Age people in this area. With thanks to Patricia Strack, who researched this object for the Community Timelines course in Evanton, and Trevor Cowie for information on dating. The results of the course can be seen on a display at the Cornerstone Cafe in Evanton over the summer. There are also binders with further information and resources at the Cornerstone Cafe and Dingwall Library. Coles, John M 1968-9. ‘Scottish early Bronze Age metalwork,’ Proceedings of the Society of Antiquaries of Scotland 101, pp. 1-110. O'Connor, Brendan and Cowie, Trevor 2001. 'Scottish Connections: some recent finds of Early Bronze Age decorated axes from Scotland,' in W.H Mertz, B.L. van Beek and H. Steestra (eds), Patina: essays presented to Jay Jordan Butler on the occasion of his 80th birthday, Groningen.